June is considered to be Pride Month, and the Department of Social Welfare and Development (DSWD) is one with the Lesbian, Gay, Bisexual, Transgender and Queer (LGBTQ) community to eliminate discrimination based on sexual orientation and gender identity. “Being true to one’s self is one of the many commendable things that we can learn from the LGBTQ community. The members of the LGBT sector are brave and never afraid to assert their rights, celebrate their individuality, and express their compassion to others despite the many types of discrimination that they experience every day,” said DSWD Secretary Judy M. Taguiwalo. Sec. Taguiwalo said that the passage of the bill will be a significant development to fight and bring down the number of hate crimes in the country based on sexual orientation or gender identity. She also said that the bill can help establish a safe environment where the LGBTQ sector can be empowered and its members can freely express their individuality without being judged or discriminated against by others. “We envision a future where being a member of the LGBTQ community is no longer an issue of controversy; where LGBTQ people can demand and then freely access the services of the government without the fear of humiliation and their rights disregarded. This is also the reason why we want to include a provision to review and strengthen government social welfare and social protection programs for the LGBTQ community and to improve their provision of health insurance with regards to their physical transformation for their chosen gender identity,” said Sec. Taguiwalo. “The LGBTQ community continues to soar despite the many forms of cruelty that they are often subjected to the more backward and conservative sectors of society. We hope that the more informed and compassionate members of the public will continue to support them and their calls for gender equality because LGBTQ rights are human rights and should be respected,” the social welfare chief added. It can be recalled that the DSWD has also released a policy last year that fosters gender-inclusive workplace, stressing that DSWD personnel belonging to the LGBTQ community have the right to comply with the office uniform styles prescribed by the Department in a manner consistent with their gender identity and expression. Preferred uniform styles of personnel belonging to the LGBTQ community will be respected i.e., either they opt to wear pants (in lieu of skirt) or skirt (in lieu of pants). Sec. Taguiwalo further said that the DSWD as an institution respects and upholds LGBTQ rights and hopes that all its employees and personnel would do the same. She said that recognizing the right of its LGBTQ employees and staff to dress based on their own preferences that are tied to their gender identification is the least that the DSWD can do. 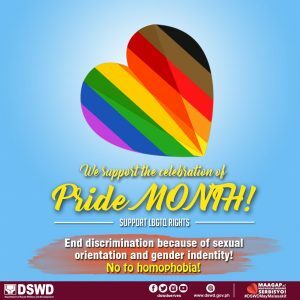 “Policies on respect for LGBTQ rights are policies that we want our employees to observe on their own volition, not because the administration of the DSWD orders them to, but because the employees themselves on their own see the importance of LGBTQ rights,” said Sec. Taguiwalo.